Falling Barrier Sparks Panic at Global Citizen FestivalThousands fled when they thought they heard gunshots. Gwyneth Paltrow and Chris Martin Watched a Dog Surf for 20 MinutesThe uncoupled pair allegedly watched the dog catch waves for 20 minutes. Gwyneth Paltrow Really Likes Calling Chris Martin Her ‘Brother’Huh. 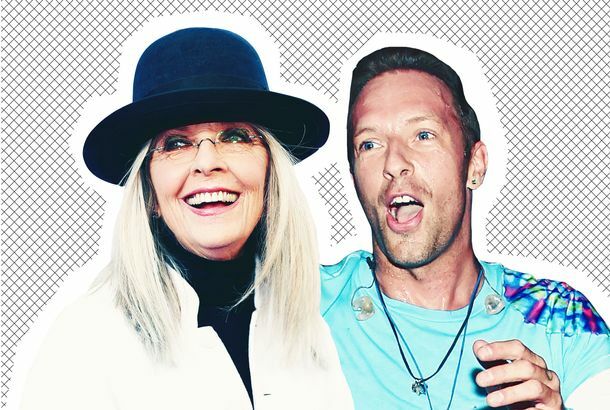 Diane Keaton Thinks Chris Martin Is Hot But Has No Idea Who He IsHorny Diane Keaton strikes again. Gwyneth Paltrow Says Ex-Husband Chris Martin Is Just ‘Like a Brother’Brother, ex-husband — same difference. Liam Gallagher and Chris Martin Performed Oasis’s ‘Live Forever’ in ManchesterChris Martin also sang “Don’t Look Back in Anger” as an ode to Ariana Grande. Apple Martin Had an Ice-Cream-Themed Birthday Featuring Jay Z and BeyoncéThe 13-year-old celebrated her birthday at L.A.’s newest hot spot. Chris Martin Sings ‘Last Christmas’ in Honor of George MichaelA fitting song choice. Gwyneth Paltrow Thinks She Changed the Culture of Divorce for the BetterWe’re still talking about conscious uncoupling. Chris Martin and Conan Sing ‘Yellow’ in CockneyThere’s just nuffin’ quite like it. Gwyneth Paltrow and Chris Martin’s Kids Are Excellent SingersAre they the next Jaden and Willow Smith? All the Tear-jerking Moments From the 2016 Global Citizen FestivalChris Martin comparing Coldplay to a toilet and much more. Go Back to the Past As Coldplay and Michael J. Fox Play ‘Johnny B. Goode’ Marty McFly is the rock star on that stage. Chris Martin: Rihanna’s Voice Like ‘Toothpaste’The Coldplay frontman certainly has a way with similes. Pioneers of Conscious Uncoupling Now Free to Unconsciously RecoupleAfter two years, two months, and one day. Tabloids Not Sure Which Blonde Actress Chris Martin Is Dating NowHeather Graham? Annabelle Wallis? Me? Jimmy Fallon and Chris Martin Sing ‘Life on Mars?’ (Not a Bit)Sailors, fighting in a dance hall. Chris Martin Tried to Write a Song Worthy of BeyoncéChris Martin did not succeed. Coldplay Were Beyoncé’s Left Shark at the Super BowlThe halftime show was a display of Beyoncé’s unimpeachable confidence in her own cultural influence and artistic vision, and the contrast of Coldplay and Bruno Mars emphasized how radical that vision really is. Watch Chris Martin’s Carpool Karaoke With CordenWoo-hoo! Chris Martin Eats Nothing One Day Per Week — UhhThe Coldplay singer claims it makes him sing better and be more grateful “for everything.” All right, man. Coldplay’s ‘Birds’ Music Video Is a Kaleidoscopic LarkGet it? If You’re Separated, Do You Have to Stop Flaunting Your Beautiful Relationship? Gwyneth Paltrow and Chris Martin lovingly celebrate Valentine’s Day together. Jennifer Lawrence Doing the Dates Again With Chris MartinBack together after breaking up in October. Kanye, Springsteen, and Bono-less U2 Were Awesome Last NightChris Martin, a little less so. Jennifer Lawrence and Chris Martin Broke UpAnd in a blink of an eye, it was there and then it wasn’t. Gwyneth Paltrow’s Underwear Remains Loyal to Her ExA secret message in monograms. Jennifer Lawrence Is Now Obligated to Like ColdplayDating a man in a band is so annoying. Chris Martin and Jennifer Lawrence Enter Back-Rub Stage of RelationshipScandal abounds. Don’t Worry, J.Law, No One Believes You’re Hooking Up With Chris MartinNo no no no no no. Gwyneth Paltrow’s Divorce Is Better Than Most MarriagesEnjoying the Hamptons with Chris Martin. Sensitive Soul Chris Martin Only Eats Animals He Senses He Could MurderHe wouldn’t want to kill a fish, but he thinks he could. Chris Martin Feeds the Kids Piles of FriesLife after Goop. Conscious Uncoupling Means Protecting Your Ex From StalkersNew documents. Last June, Chris Martin Tasted Forbidden Fruit: An Oreo MilkshakeDairy! The One Woman Who Cares Lots About Chris Martin’s Side of ThingsBridget Everett to the defense. From What Would You Like to Consciously Uncouple?It’s the GOOP way of breaking up. Gwyneth Paltrow and Chris Martin Are DivorcingThis news via GOOP post. Watch Paltrow Onstage With Jay-Z on NYEDon’t worry — she didn’t try to rap.